With such an impressive dimensions of the print area, the printer will allow you to create large models or several different smaller models simultaneously. The TAZ 6 occupies a pretty large space on the desktop. The LulzBot is an excellent printing solution with impressive specifications and parameters, which offers a fully automatic preparation for the work using the self-leveling and self-cleaning features. With this device, you can create hilarious models easily. Layer resolution: 0.002" - 0.02"
Build volume: 11.02" x 11.02" x 9.8"
Dimensions: 26" x 20.47" x 20.47"
The use of 0.4-inch in diameter metal rods as the CreatorPro structural elements ensures a precise travel of the platform along the Z-axis. The control panel on this model is inclined at an angle of 45° to facilitate the printer control. This printer by FlashForge requires a long configuration and setup procedure before the work. 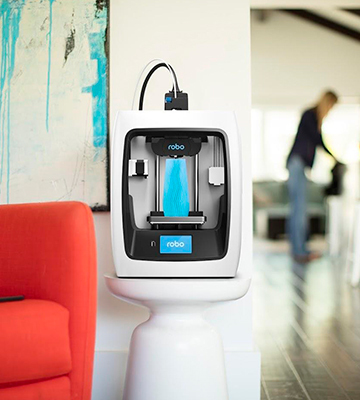 Being a professional-grade high-precision 3D printer, the Pro model has a practical design allowing a convenient access to the printing chamber. 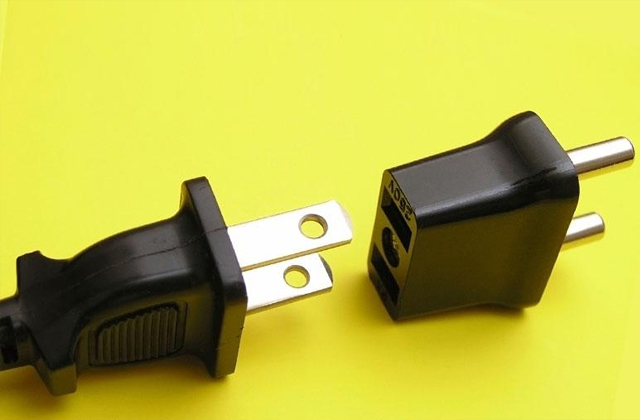 The implementation of two print heads enables a creation of high-quality models composed of several elements or fabricated using two different materials. Positioning precision: XY: 0.0004"; Z: 0.0001"
Layer resolution: 0.0039" - 0.019"
Build volume: 8.9" x 5.8" x 5.9"
Dimensions: 18.7" x 13.1" x 15.1"
The ROBO 3D offers the feature of your fabrication process partial control and monitoring from your mobile device, after installing the proprietary application on the mobile device. 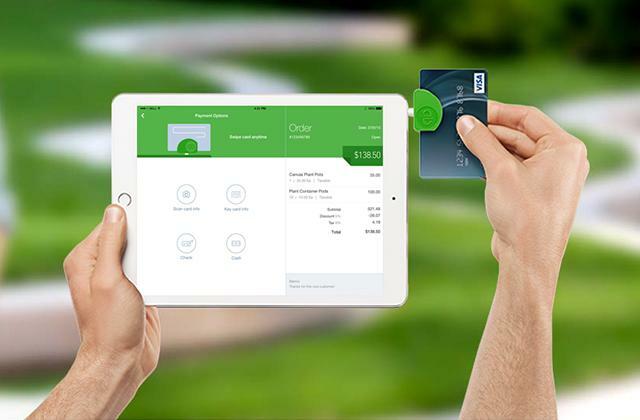 Robo App software is currently available for installation on iOS-powered devices only. 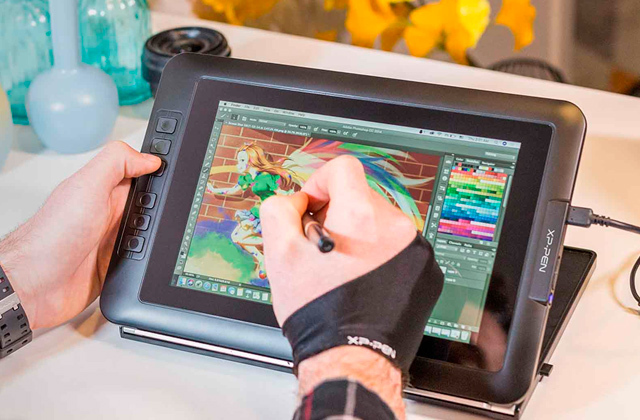 The C2 stylish printer with unique control capabilities and cutting-edge technologies implemented will appeal to both experienced users and beginners. Moreover, even children can use Robo C2 for the fabrication of spectacular 3D models. 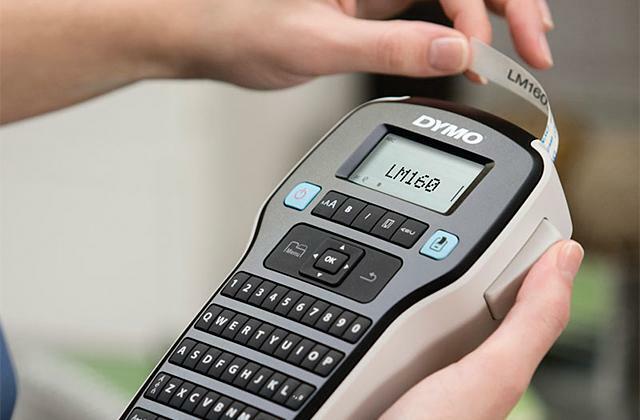 Positioning precision: XY: 0.0005", Z: 0.0002"
Layer resolution: 0.00079" – 0.012"
Dimensions: 18.25" x 13" x 12.75"
The da Vinci 1.0 Pro model comes equipped with a built-in scanner, giving you even wider possibilities for models scanning, data processing and creating new models and figurines. 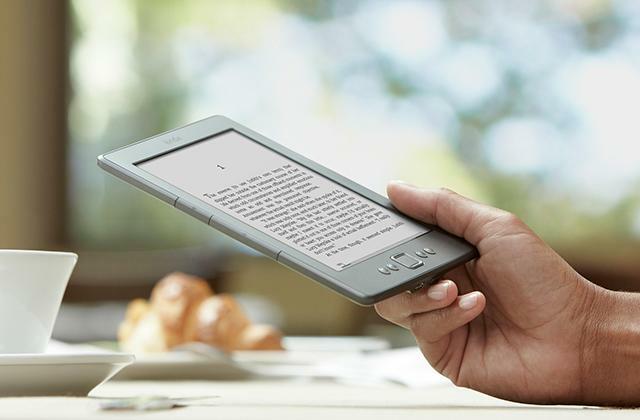 The device is hard to carry around because of its fairly large weight. 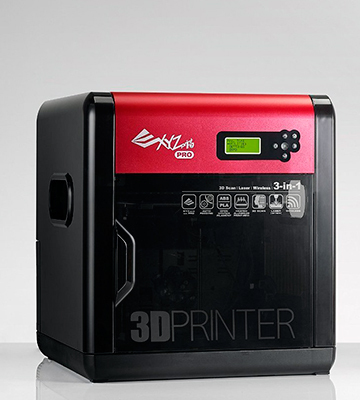 The XYZprinting released a truly multifunction 3D printing workstation that offers a laser engraver connectivity allowing you to create exciting 3D models as well as digitalize the existing ones. Layer resolution: 0.004" - 0.016"
Build volume: 7.9" x 7.9" x 7.5"
Dimensions: 18.4" x 20" x 22"
This 3D printer by Monoprice comes fully assembled and calibrated, with the supply package including a filament thread sample and a memory card containing preloaded models. Thus, you can use the device for your printing out of the box. A relatively small build volume of the Select Mini makes it impossible to fabricate some models that you can make with other printers. 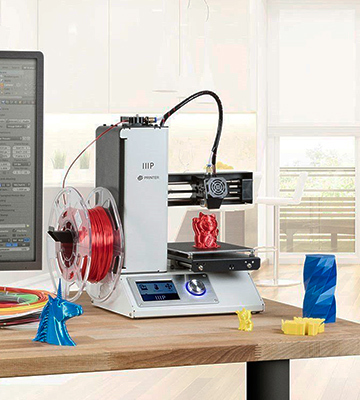 This Monoprice 3D printer is a decent entry-level solution that is shipped in a fully assembled state and allows you to quickly and easily learn the basics of 3D modeling. Build volume: 4.7" x 4.7" x 4.7"
Dimensions: 13.5" x 11.3" x 7.5"
XYZprinting da Vinci 1.0 Pro. 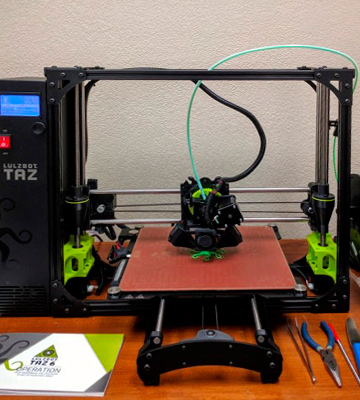 The LulzBot TAZ 6 model is one of the best 3D printers for home or professional use you can find on the market. Utilizing the FDM technology, this device lays and fuses building material layer by layer thus creating various three-dimensional parts. The TAZ 6 is very simple to operate and therefore many professors, designers and engineers choose it for their work. One of the undeniable advantages of the printer is its impressive printing area and build volume allowing the device to create 3D models with maximum dimensions of 11.02 "x 11.02" x 9.8".Objects of this size are comparable with the size of a basketball so you can create really big 3D models right on your desktop. The printing platform of this desktop 3D printer is made of borosilicate glass and covered with PEI print surface, with that, it is heated and therefore enables you to use different filament materials. 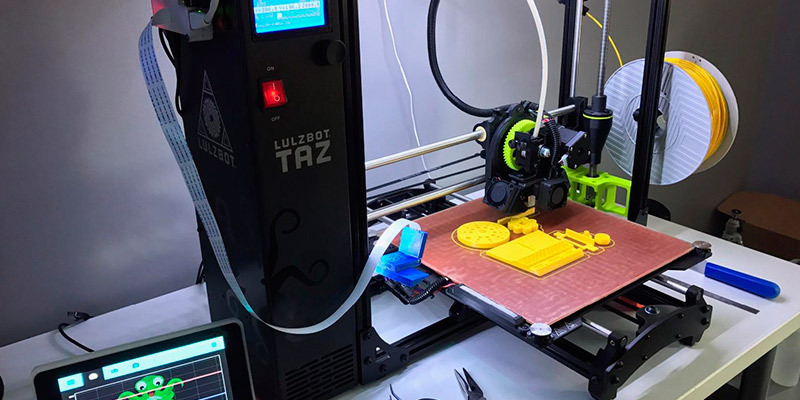 This 3D printing device by LulzBot offers a wide compatibility with various materials, such as ABS, PLA, HIPS, PVA, wood filled filaments, Polyester (Tritan), PETT, as well as bronze, copper, stainless steel-filled filaments and many synthetic materials. Moreover, this list is constantly expanded. Please note that the diameter of filament threads or wires used is 0.1 inches, which is an important parameter to consider when purchasing building materials. One of the obvious advantages of the TAZ 6 model is the carriage modular design, which allows using different kinds of extruders. 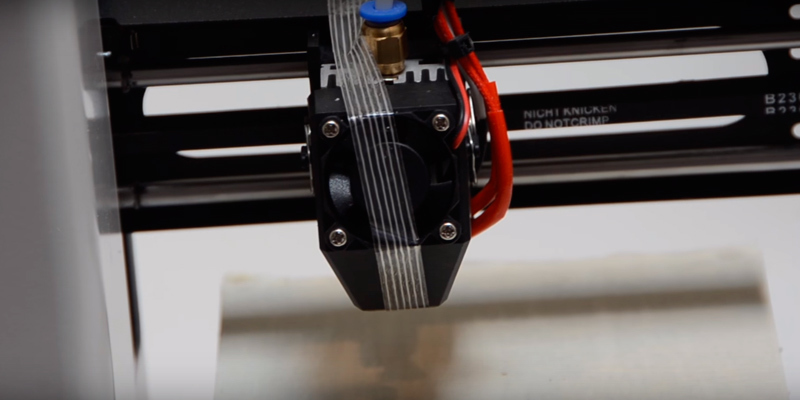 Initially, the printer comes with one extruder, but if you wish so you can additionally purchase a double extruder that can print using two different filaments or two filaments of different color at the same time and install the extruder later. The filament spool used attaches to a side of the frame of the printer's body, which simplifies its use. 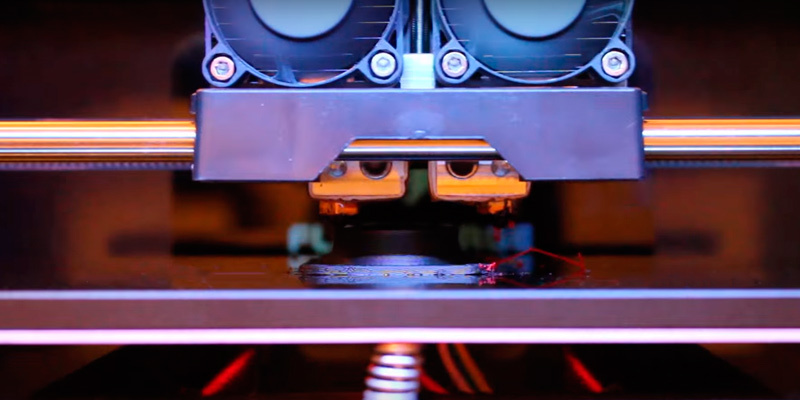 The availability of three fans that blow over the extruder provides better temperature control during the printing and, as a result, more accurate fabrication. The self-cleaning and self-leveling features that the printer offers save you much time preparing the device for work. Before starting to print a new model, the printer extruder automatically cleans itself when positioned in a dedicated place on the side of the printing platform with the platform auto leveling procedure carried out. Therefore things that potentially could complicate the use of the printing device, are eliminated in the TAZ 6, allowing you to fully focus on the manufacture of three-dimensional objects. The printer comes with the Cura LulzBot Edition software, among the benefits of using which is convenient user interface, completely free updates and hundreds of built-in profiles for various printing options. 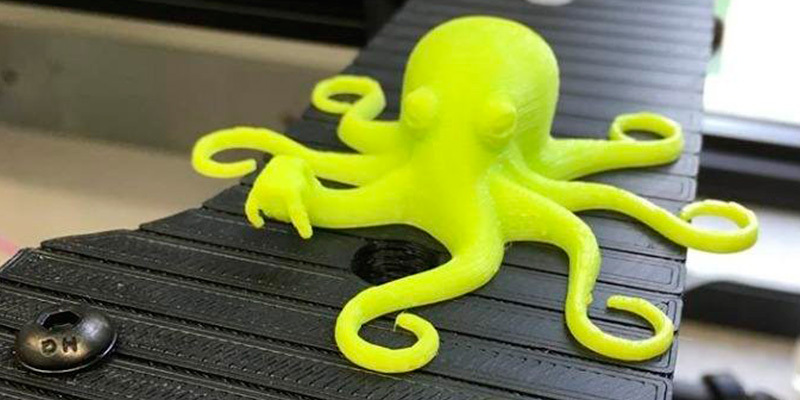 At the same time, Cura LulzBot Edition can work freely on such operating systems as Windows, Mac OSX, and Debian, Fedora, Ubuntu Linux distributives. Those people who are interested primarily in high-quality 3D printing, are recommended to consider the Creator Pro model by the FlashForge company. What makes this high-quality 3D printer even more attractive compared with its previous version are significant changes and improvements that made the printer even better. 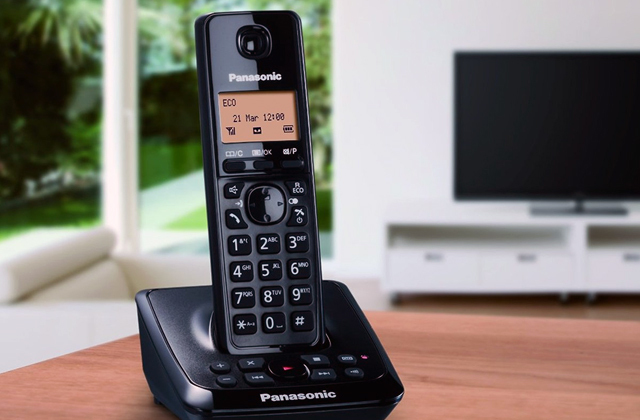 The updated model is built around a metal frame, which not only ensures a more accurate positioning of the device moving parts but also a longer service life. The use of metal in the Creator Pro structure has also made it possible to achieve a high body rigidity as well as to reduce vibrations when model printing is in progress. The vertical support used in the Pro model is better stabilized when the printing platform is moving, which undoubtedly contributes to the quality of the resulting 3D models. The improvements allowed to achieve the accuracy of the extruder assembly positioning at the rate of 0.0004" along the XY axes and the 0.0001" along the Z axis. The printer is designed as a closed chamber with an openable door and a removable cover, which make keeping the desired temperature inside and preventing the dust from getting inside the chamber much easier. The door can be opened through an angle of 180 degrees, allowing a convenient access inside the chamber to extract the finished model or remove accumulated garbage. 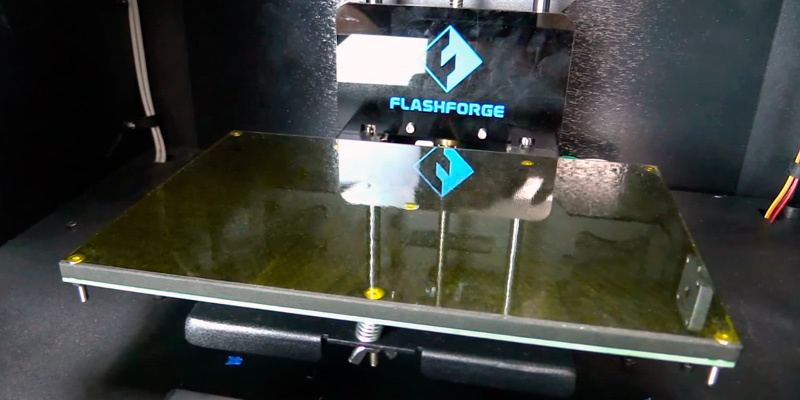 The cover has a unibody design in contrast to the prefabricated panels of this printing device from FlashForge thus making its handling easier. With that, the cover is completely transparent, which allows you to better monitor the fabrication process. Reattaching the cover after removing it is not difficult at all, all you need to do is to align the cover along the four corners. There are two convenient handles on the printer sides, which you can use to carry it to a new location if necessary. As for the materials, from which this one of the best rated 3D printers was made, it is worth mentioning that its printing platform is made of high-quality aluminum, which is used in the aerospace industry. The platform is fitted with heating elements thus making it possible to use such materials as ABS plastic and fabricate more precise 3D models. Due to the platform thickness of 0.25 inches and use of an aluminum as its build material, the printing platform effectively distributes the received heat throughout its surface ensuring optimum printing conditions. For an accurate manual leveling of the platform in this FDM printer, the manufacturer allowed for two plastic handles. The control panel is affixed at the 45-degree angle to the printer body, which provides a more comfortable control of the device. At such an angle, it will be much more convenient for you to read the information on the display, even if the device is positioned much lower than at eye level. The FlashPrint software that comes with the Creator Pro is so versatile that it suits for both beginners and experts in 3D printing. An intuitive user interface and a wide range of advanced settings available in this software bundle will provide a more accurate model printing based on the specified parameters. With that, you can even divide the model into several parts if it is too large for the printing chamber, which build volume is 8.9" x 5.8" x 5.9". Perhaps, the title of the most creatively different and distinctive device in our review can be rightly awarded to the Robo C2 model. 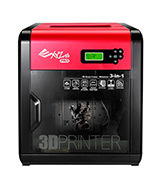 This one of the best affordable 3D printers, first of all, differs from its competitors in its compactness. The overall size of this piece of equipment measures 18.25" x 13" x 12.75", which allows you to freely place it anywhere, even on your desktop, among other equipment.The printer has a modern design with the body painted white and blue and the frame elements complemented with transparent plastic panels allowing a more comfortable observation of the printing process.The printing chamber of this model is semi-closed and is protected by walls on three sides with the open front side providing a convenient access inside the printing chamber.The maximum build volume of this chamber is 5" x 5" x 6", which is slightly less than that of other competing models, but considering the overall size of the printer, it's a decent volume. The filament holder is attached to the back of the device body and serves for holding a material spool. 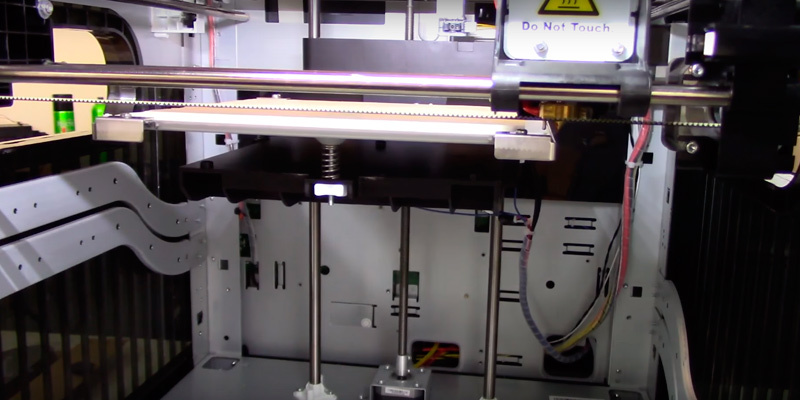 The filament is fed to the print head assembly that contains the extruder through a special tube, which is pre-inserted at the printer assembly stage. Securing the filament thread is done by pressing a dedicated button, at that it is important to keep in mind that the Robo C2 works with threads of 0.069" diameter. It is also important to know that the printing platform is not equipped with heating elements, which restricts the choice of filament types. The platform is easily removable, which significantly facilitates the finished model extraction. Before printing your 3D model, it is advisable to align the platform using the "paper sheet" method: adjusting the height of each platform corner and at the same time shifting a paper sheet put on the platform from the centered position to each corner; adjust the corners' height until the paper sheet is hard to shift from the center. Unlike most entry-level small 3D printers, this model is equipped with a built-in Wi-Fi module and a LAN port in addition to commonly used USB and card reader data exchange interfaces. 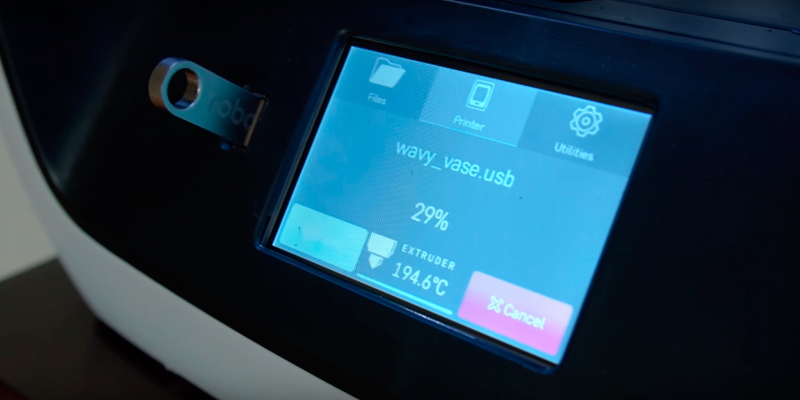 Thus, this versatility enables you not only print 3D models directly from your PC or use pre-created G-Code files on an inserted memory card or a connected flash drive but also connect the printer to your local network to get the data. 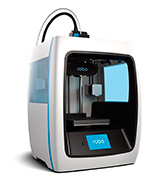 Moreover, the Robo 3D C2 is even capable of printing directly from mobile devices using the Robo app. At the moment, the application is available only for the iOS platform, however, the version for Android devices is in the works. Speaking of the advantages that the Robo App has it is necessary to point out that its main purpose is to provide a convenient control of the model editing and fabrication process directly from your mobile device. 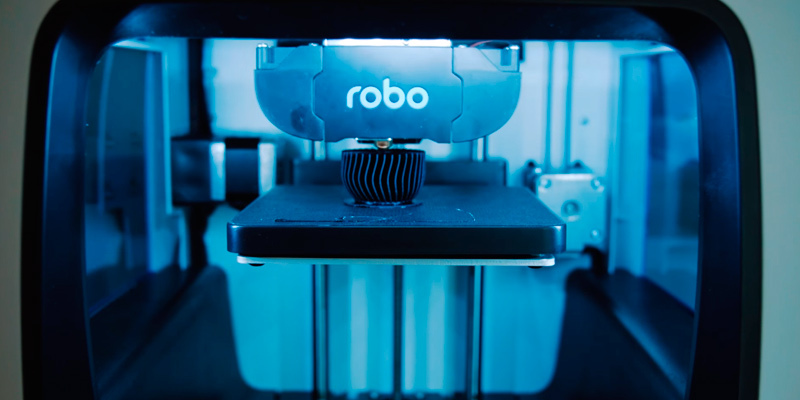 Using the Robo App allows you to see the current progress and the remaining time of the model printing, monitor the observance of a temperature mode, configure the operation of the cooling fans and make other adjustments. By connecting to the Internet library, you get an access to the storage containing hundreds of different models, which you can download and print on your printer. Moreover, using this application unlocks a very convenient way of ordering additional materials and accessories via the Internet. 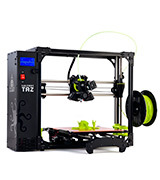 This arguably best 3D printer in terms of compactness and weight is an excellent option for those who know the value of time because the maximum speed of this printing device reaches the 9.8 in/sec value. This is much higher than many professional models can achieve. With such speed, all your models will be created in less time. We suggest those who decided to seriously engage in 3D-modeling take a closer look at the da Vinci 3-in-1 professional printer. The model got the "3-in-1" in its name, not for nothing and offers a number of extra features in addition to that of printing three-dimensional objects, which we will talk about later in more detail. However, before getting to the device internals let's look at its exterior: the da Vinci has a stylish and at the same time practical design great Leonardo would have been pleased of. The printer body is manufactured as a closed structure with a built-in printing chamber. The body finish in black and red colors makes this additive manufacturing equipment a modern looking device. The external dimensions of this multifunctional printer are 18.4" x 20" x 22", which makes it easy to use it on your desktop. With two recessed carrying handles on the sides, this prototyping device is convenient to carry, especially considering its 60.6-pound weight. As for parts and objects creation, this printer by XYZ fabricates the models in the closed chamber, which can be accessed by opening the front door.The door is made of a semitransparent material, allowing you to freely observe the fabrication of a model and providing an isolation of the build chamber from the dust and small waste particles. 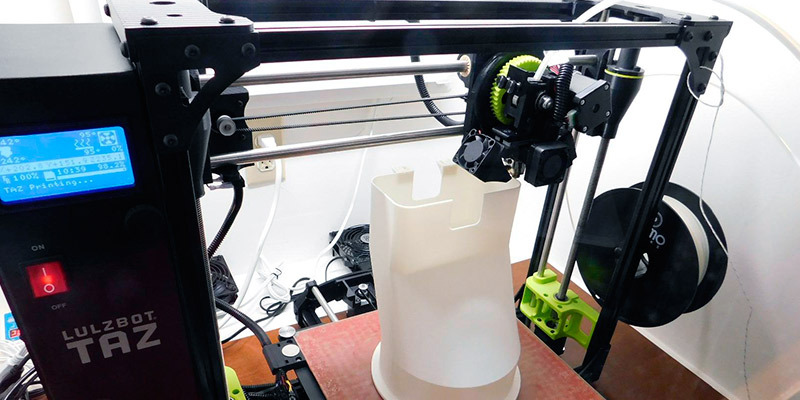 As many peers, this 3D printing solution uses the FFF technology for model fabrication, while the availability of heating for the printing platform allows users to work with various materials, including PLA, ABS plastic, etc. The maximum build volume of this one of the top rated 3D printers is 7.9" x 7.9" x 7.5", which makes it possible to create medium-sized models. Add the print speed of 4 in/sec and you get an amazing tool to render your virtual models real. 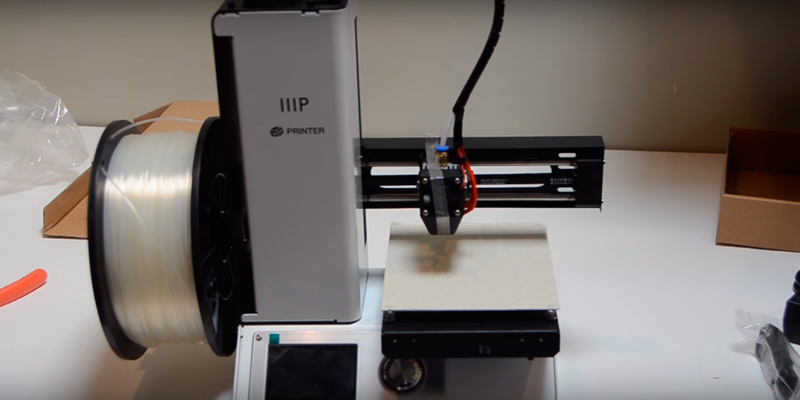 As we mentioned above, the da Vinci printer is a 3-in-1 device, which offers such additional features as a built-in 3D scanner and laser engravers connectivity. Please note that you need to purchase an engraver separately if you want to use it with the printer to engrave on your models. The 3D scanning feature allows you to make digital copies of the objects scanned for further processing and adjustment. The ability of this multifunction device by XYZ to scan objects at different angles allows getting the most accurate duplication results and combine the data acquired during multiple scannings later into one complete model. 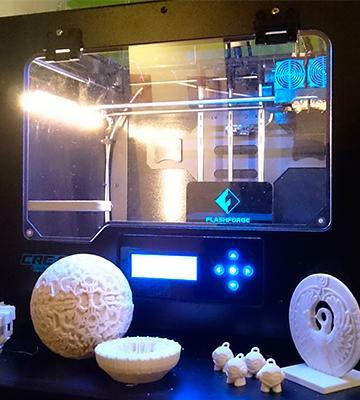 Owing to an automatic rotation of the platform through 360 degrees around the vertical axis, you can easily scan your model literally from all sides, which makes the da Vinci probably the best 3D printer for figurines fabrication. 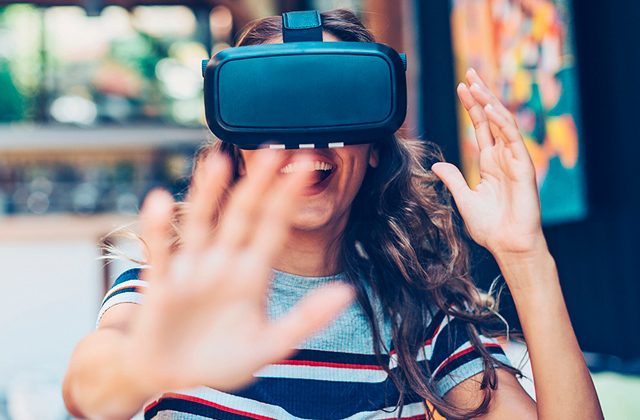 The resulting virtual models can be edited using the bundled and specialized software, which allows size increasing, position adjustment and many other object manipulations. The availability of the built-in Wi-Fi module allows you to connect this XYZ 3-in-1 printer to your laptop or desktop PC in a minute. With that, your host device can be located in any place within the range of Wi-Fi signal reception and not only in your room. Now you are saved the trouble of using multiple connection cables and given more freedom in establishing your home studio for fabricating three-dimensional models and parts. Along with controlling the printer from the host device, to which you connected your da Vinci this model allows for using the built in controls. The navigation buttons and the display are on the printer front panel top. Using the control panel you can conveniently change printing settings, select different print modes, etc. 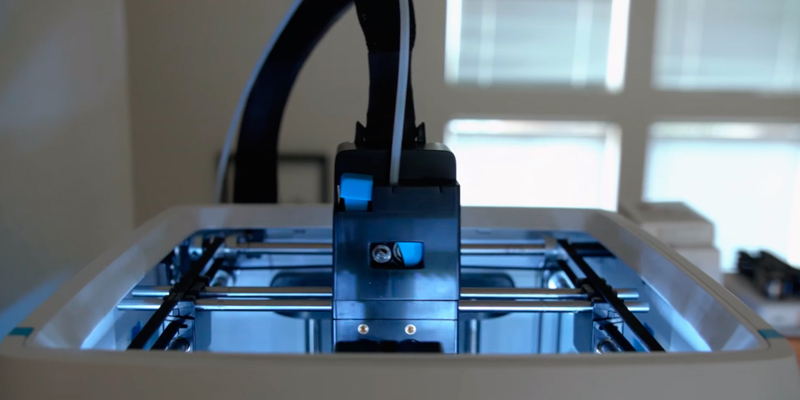 This one of the best affordable 3D printers by Monoprice stands out from the rest in its league because it combines convenience, simplicity, and compactness. Such combination makes this model an ideally-suited solution for those users who are just beginning to study and try printing three-dimensional models and parts. Contrary to the most DIY 3D printers, this device is shipped in almost completely assembled state, all you need to do before start printing is to unpack and attach some elements to their places according to the included manual. Monoprice designed this model with a completely open frame so that you could conveniently view your models being printed from all directions. The device is equipped with a printing platform that is pre-calibrated at the factory and offers a preheating feature. However, we recommend you to verify its correct position to prevent the resulting models from being skewed. This can be easily done with a paper sheet, aligning the position of the platform with respect to the print head. As for the filament spool, it attaches to the printer frame's side, and for easier handling, the filament thread is secured with a special spring-loaded clip, which also simplifies its release when you need to replace it. Well matched structure elements enable this device to work with various materials, such as PLA, ABS as well as with more advanced ones like wood, composite filaments, and dissolving PLA. The print speed is 2.16 in/sec making the wait for your model to be finished comparatively short. 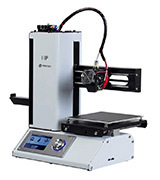 In general, the Monoprice Select Mini, as the name suggests is more suitable for a fabrication of small and medium-sized models. The model's maximum build volume is 4.7" x 4.7" x 4.7". 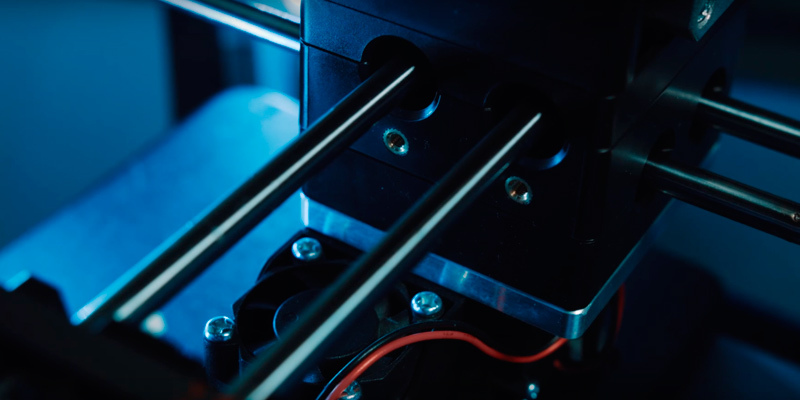 For a better control of temperature conditions, in addition to the heating of the platform, Monoprice fitted the Mini with 2 cooling fans, one of which is aimed at the metal nozzle of the extruder, and the second is integrated into the lower part of the device body. Another characteristic feature of this model by Monoprice is that the printer is compatible with almost any software. 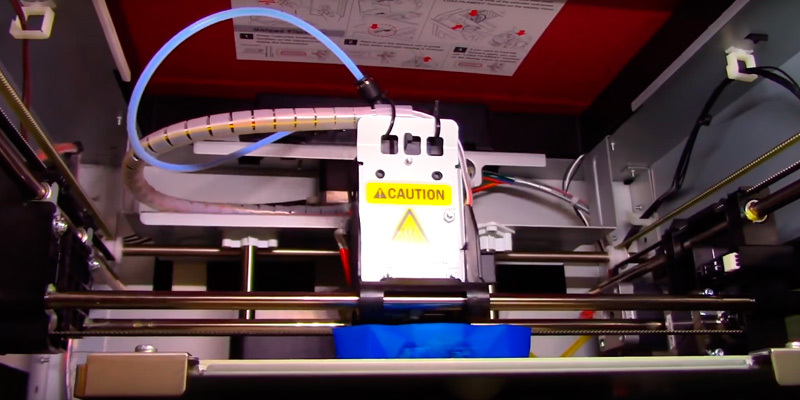 The manufacturer recommends using Cura, but if you wish, you can easily install such popular software applications as Repetier-Host, ReplicatorG, Simplify 3D and similar solutions to use with the Select Mini. The support of operating systems is quite advanced and allows you to control and configure your printing device in Windows and Mac OSX, as well as in Linux. 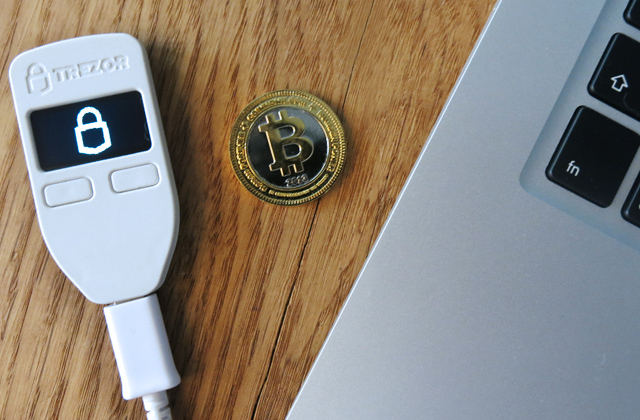 As a modern digital device, this model features built-in Wi-Fi module and a USB port for connecting to your PC or a laptop. To start the printing of your model right away, you can load pre-created models in .stl and .obj formats to a supported memory card and print directly from the card with no host device connected. 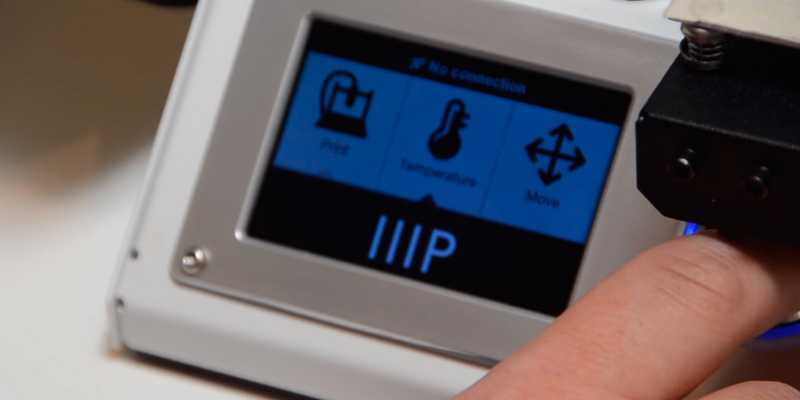 You can control and configure the printer directly from the control panel conveniently located on its body. The control panel itself consists of two elements: a 3.7-inch IPS screen and a turn-push button. The menu is very simple to navigate through as all the menu items are broken down into categories. As a pleasant bonus to an almost completely assembled and configured condition of the printer shipped come an included PLA sample for printing and a memory card containing several preloaded models for testing. 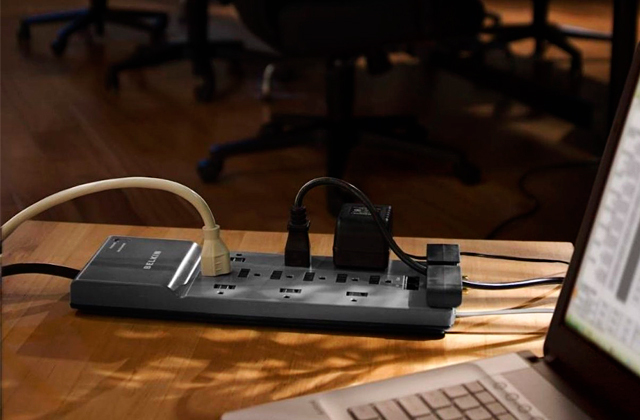 You can start working with the Select Mini immediately after unboxing it and plugging the cord into a power socket. 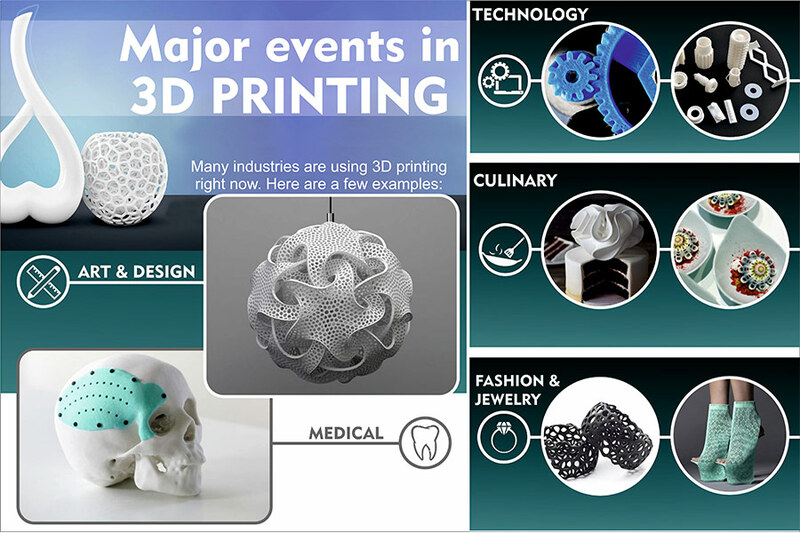 3D printers are the devices that use the layer-by-layer printing method to create physical objects based on digital models. These objects can have practically any shape and geometry. In essence, the printers are peripherals relating to one of the types of industrial robots. Nowadays they are used not only in production field but also at home. 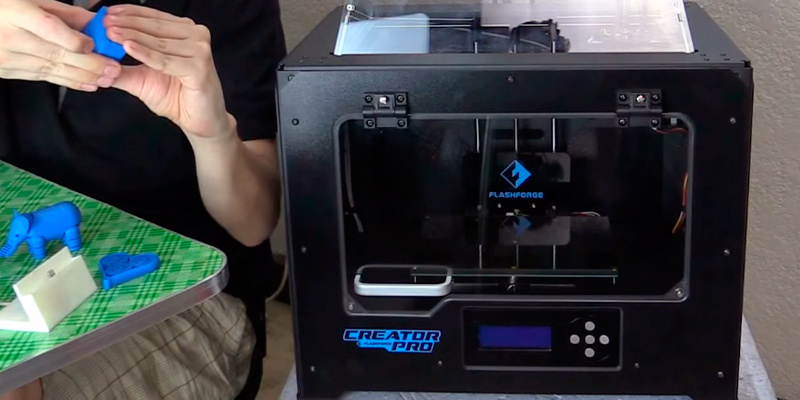 In our today's review, we will talk about how to choose a 3D printer. 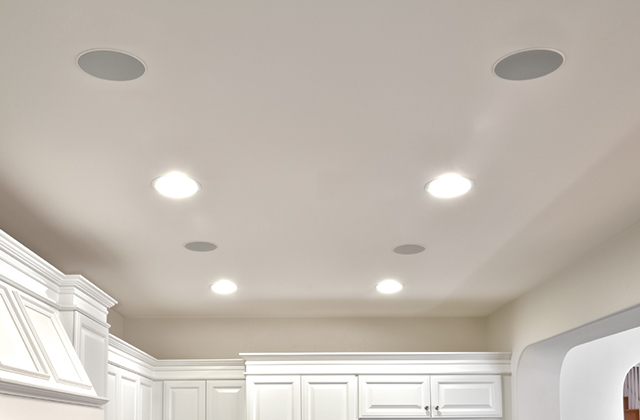 These devices become more widespread and, which is even more important, more affordable. If you plan to start the manufacture of various decorations and fashion jewelry, small souvenirs or trinkets you may find our scrapbook cutting machines review interesting. 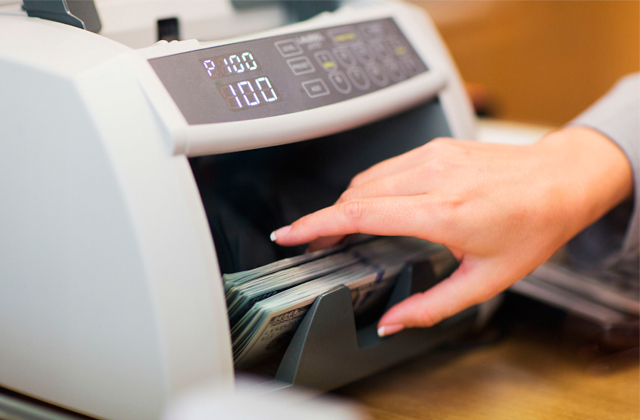 When choosing a printer you should pay attention to one of its basic parameters, such as Functionality, the parameter covers the specifications of print area (area of resulting object forming) and the material, which the printer utilizes. When choosing the printer according to this parameter you should take your requirements as a point of departure. To be sure, the larger print area provides more opportunities for creativity. 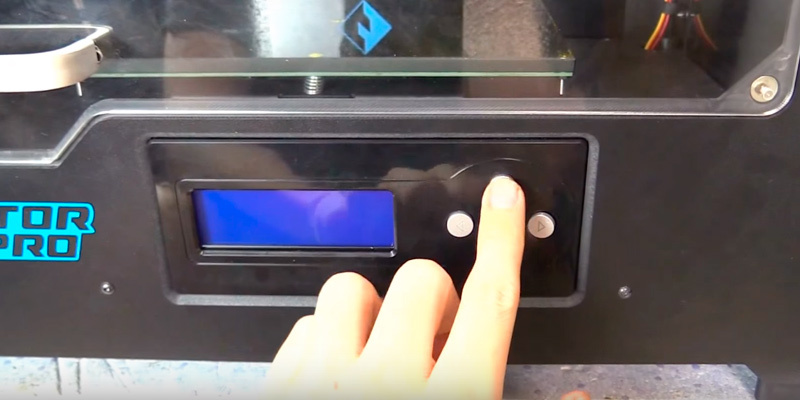 3D printer does not print the whole object instantly. As a rule the printing of an object takes from a few hours to a couple of days, and when printing the big projects - weeks. Therefore, the parameter that characterizes the thickness of material a printer can lay on a detail in one pass is very important. However, one should remember that the print Speed and accuracy (mm of the material a printer layers in one second) might affect the accuracy of printing. To characterize a printer in a most accurate way the Speed and accuracy needs to be summarized and one should stick to happy mean. The optimal speed of material layering a 3D printer system should maintain while esnuring the highest quality is 0.2 mm/second. Not every 3D printer can be called easy-to-operate. For the most part, the wider capabilities a 3D printer has the bigger the number of the appropriate settings are, though at the same time the more complicated the software may be. Therefore, it is necessary to evaluate properly such parameter as Usability. There are printers that can be run with a single mouse click. 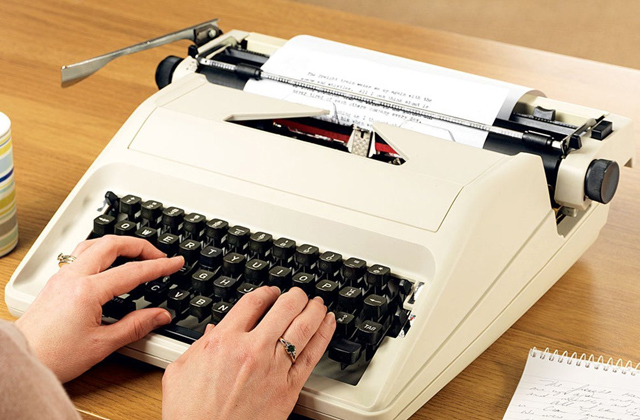 For example, some printers are equipped with a display that enables them to work in astandalone mode. 1. 3D Printing, Wikipedia. August 4, 2016. 2. 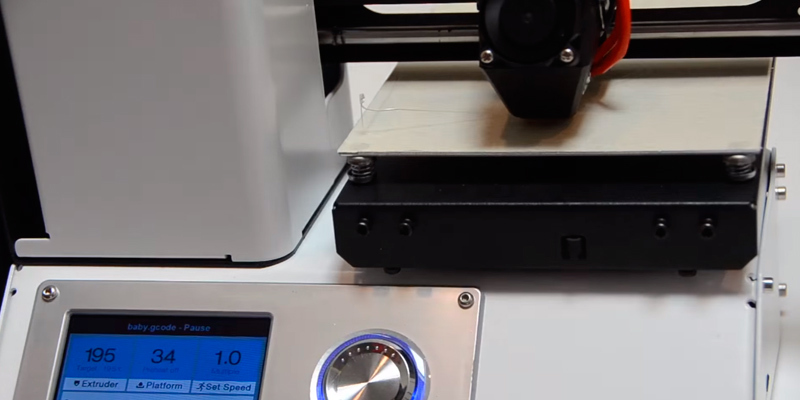 Azwan Jamaluddin, 10 Things You Need to Know Before Buying a 3D Printer, Hongkiat. 3. Brahim Daouas Buyer’s Guide: How to Choose / Compare 3D Printers, RobotShop. June 11, 2015. 4. 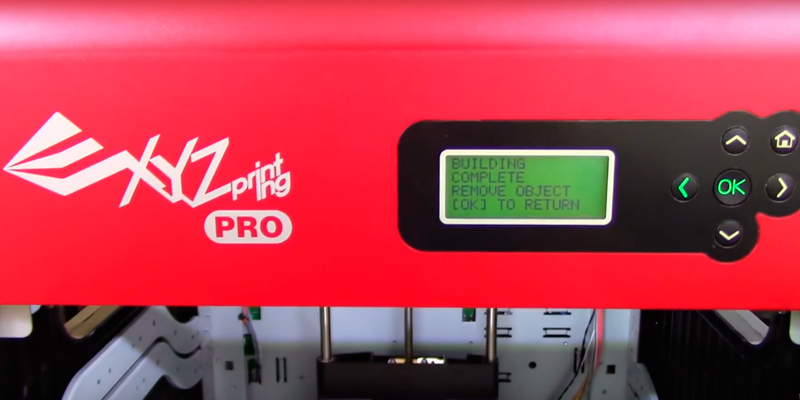 Azwan Jamaluddin 10 Things You Need To Know Before Buying A 3D Printer, HONGKIAT. 5. How to Choose, Use and Improve a 3D Printer, instructables. 6. 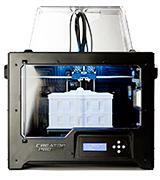 Anatol Locker 10 Reasons Why You Should Buy a 3D Printer for Home Use, All3DP. July 22, 2017. 7. 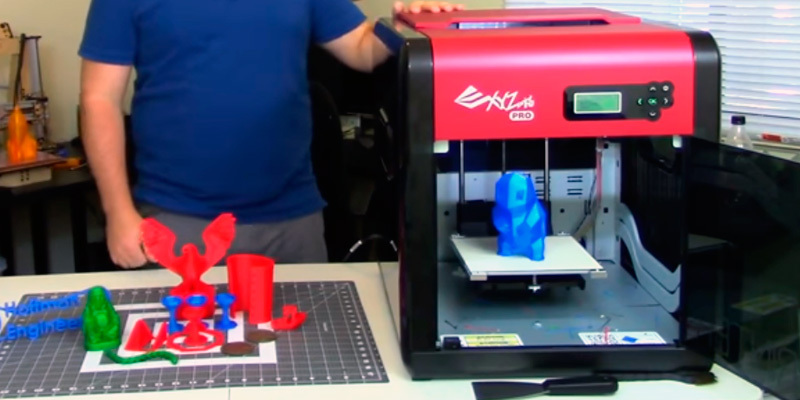 Chris Hoffman When Will 3D Printers Be Worth Buying For Home Use?, How-To Geek. January 7, 2015. 8. How to Fabricate a Toy Model from Scratch, POPULAR MECHANICS.